It's one thing to count on God's grace when we are in the clear, when we have honestly done nothing wrong. Maybe we've been wronged; but we've done no wrong. Grace is surely coming then. But what about when we have finally come face to face with our ugly? When we've owned the mess we've made? Maybe we can hope for grace, but can we boldly ask for it? I went looking for David's hanging head and solemn words in the familiar Psalm 51. I knew of his confession, his repentance, his sorrow. I thought I'd find a pattern of sorts for my own admission of guilt. But I also found a man deeply familiar with God's grace, a man who expected to find grace in the pit of his own making. And David didn't wait until he'd spilled his ugly confession to ask with head hung low for a little grace. "Be gracious to me, O God, according to Thy lovingkindness; according to the greatness of Thy compassion blot out my transgressions, wash me thoroughly from my iniquity, and cleanse me from my sin." Wait a minute. Shouldn't David clean up his own mess? Shouldn't he apologize a little more profusely before so boldly requesting cleansing? Shouldn't he throw in a few promises of "doing better" or making it right? But David knew a God of grace. He had called on God to be gracious before (see Psalm 31:9, Psalm 56:1, Psalm 57:1), and God had surely given him what he lacked. Sometimes I think forgiveness is something I can earn, something I can pay sufficiently for, something I can attain over time...with a clean track record. But I can't earn it. I can't pay for it with good deeds. And I can't even keep my track record clean. When I sin and mess things up terribly, which I have surely done, my only hope lies in the fact that I serve and know a gracious God. And He is indeed so gracious. So gracious. So gracious. Want a glimpse of God's grace in David's deplorable situation? It will amaze you. Take a look at 2 Samuel 12:13, 2 Samuel 12:20 (you can't worship a God who has His back to you), and 2 Samuel 12:24-25. And when you look at that final passage, you need to keep in mind that Jedidiah means "beloved of the Lord." Do you desperately need the grace of God in order to see the light of day? I do. I'm counting on God's grace to cleanse me from my sin, to make me hear joy and gladness again, to create in me a clean heart, to renew a steadfast spirit within me, to restore the joy of my salvation and to sustain me with a willing spirit. Gladness, joy, a steadfast spirit, a willing spirit. These are no small survival tools; these are luxurious riches! David needed those very things, and he asked God for them with bold confidence. We have a God who remains for us even when we have turned our backs on Him. That is grace. And that is our hope. If you find yourself in a situation of hopelessness or hurt caused largely by your own sin, don't despair. God is still for you. He still has blessings in reserve to pour out upon you. He still has a plan for you. He still has healing to give and wholeness to restore. He still loves you. And, yes, He still delights in you. God doesn't just want to get you out of your mess. 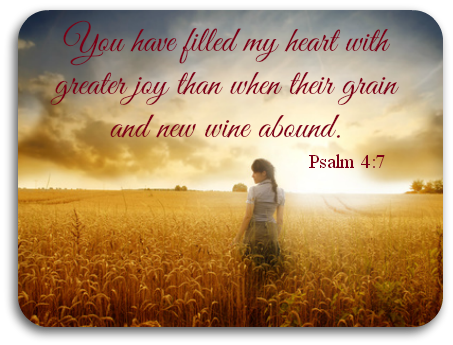 He wants to give you great joy again! What grace!